Interior of the Comédie Française, A. Meunier, 18th Century. The golden age of French playwriting, corresponding in influence and achievement to the Elizabethan era in England, was the mid-17th century. This era produced the great triumvirate of the French classic stage: the tragic dramatists Corneille and Racine and the master of comedy, Molière. So great was their success and their reputation in their own era that their work served as models for dramatic authors for generations. So great was the renown of these three masters, however, that their glory has tended to eclipse the contributions of others, as Shakespeare has eclipsed many talented contemporaries and successors. This has been particularly true of Jean-François Regnard, who was the first major comic dramatist to appear in France after the death of Molière in 1673. At the time of Molière’s passing, Regnard was still a youth of 18, who showed little promise of a distinguished career in playwriting. Like the hero of his most famous play, he was the sole heir when his father, a prosperous merchant, died two years later. The fortune allowed him to travel widely across Europe and experience a wide range of romantic adventures, including a capture in 1678 by Algerian pirates, who took him as a slave to Constantinople, where he was ransomed by the French consul. This experience did not lessen his love for travel, and he gained his first literary fame through a book about his wanderings across Northern and Central Europe, published in 1681. Back in Paris, he turned his hand to playwriting, and from 1688 to 1696 became one of the most popular authors at the Comédie Italienne. Although Italian improvised comedy, the commedia dell’arte, had been seen at the French court since late in the previous century, a troupe of Italian actors established a permanent theatre in Paris in 1653. Their language was no major barrier since their productions relied heavily on farcical action, song and spectacle. Still more and more French naturally began to creep into their performances, and in 1684 they were given permission by the king (the official sponsor of the theatre) to perform works entirely in French, like their rival, the Comédie Française, the company which had been led by Molière. At first this did not seriously affect the sort of plays presented at the Italienne, which remained primarily loosely organized entertainments in the commedia tradition, with traditional stock characters—the young lovers, the miserly father, the wily servant—traditional farcical actions and verbal interchanges, song and spectacle. 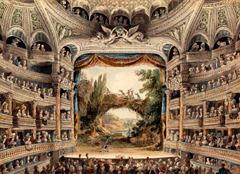 Soon, however, dramatists with a more literary concern were attracted to the theatre. The most important of these was Regnard, who made his theatrical debut there with a one-act comedy, Le Divorce, in 1688. Although all of Regnard’s comedies have close connections to the commedia dell’arte tradition, spectators who are familiar with the work of Molière are more likely to see a strong influence of that author. Actually, there is no contradiction here, since Molière himself was clearly strongly influenced by the work of the Comédie Italienne, with whom his company shared the same theatre during some of his most productive years. The misunderstandings, the extensive use of disguises, especially by the witty servants, the romantic rivalry between fathers and sons, the elaborate plots and intrigues, the parallel love pairings between the hero and heroine and between their servants and the grotesquely exaggerated members of the older generation all came to both Regnard and Molière from the commedia. Nevertheless, Regnard certainly shows direct influence from his French predecessor as well, and one can hardly mistake the echoes of plays like The Miser in Regnard’s best-known work, Le Légataire Universel (The Heir Apparent). For almost a decade Regnard regularly provided plays for the Comédie Italienne, light-hearted studies of contemporary society primarily based on love intrigues and the antics and plots of ingenious servants. Other writers at this theatre, however, created works that began to trouble the court, works that were more licentious and, worse yet, irreverent about influential figures, like the King’s mistress, Madame de Maintenon. A satire widely thought to be directed at her caused the theatre to be closed in 1697. This was not a serious blow to Regnard since he had already begun to have his work represented at the more prestigious national theatre, the Comédie Française. From 1697 onward Regnard became the leading contemporary comic dramatist at this theatre, which produced 11 of his plays. Although most other comic dramatists of the period now wrote in prose, Regnard returned to Molière’s favored practice of writing in rhymed couplets, and his success gave significant new life to this comic style. The three plays for which Regnard is primarily remembered (he wrote 25 in all) were all premiered at the Comédie Française: Le Joueur (The Gambler) in 1696, Les Folies Amoureuses (The Amorous Follies) in 1704 and what is generally considered his masterpiece, Le Légataire Universel (The Heir Apparent) in 1708. All of these contained sharply drawn comic characters, witty exchanges and engaging plots with much use of disguise and intrigue. But probably the feature that gave The Heir Apparent its extra appeal was that in it Regnard went beyond such individual foibles as gambling or absentmindedness to consider one of the great comic themes in Western drama from the Renaissance onward, the struggle over inheritance. It was also his final full-length work, as he died the following year. For the next century and a half, Regnard remained a frequently produced author, not only in France, but also in much of Europe. By the middle of the 19th century, however, his reputation was fading. The new interest in realism then on the rise in the French theatre and elsewhere found the classic tradition of writing both tragedies and many comedies in verse much too stiff and artificial for changing tastes. Equally important, although Molière’s popularity continued and if anything increased with the passing of time, that very prominence caused Regnard to be more and more regarded, not entirely fairly, as a pale imitator of the master. His imitations were seen as following the “lesser” Molière, the commedia-influenced farces like Le Bourgeois Gentilhomme or La Malade Imaginaire, and not the darker psychological comedies, more suited to 19th century taste, like Tartuffe or Le Misanthrope. He developed his own comic style, more attuned to the subtleties and nuances of everyday life and yet full of complicated plotting that made less use of devices like lengthy repetition than did the farces of his predecessor. In such ways he looked forward to Beaumarchais as well as backward to Molière. In the latter 20th century, Regnard’s reputation has to some extent been restored by literary scholars like Dorothy Medlin and by a number of engaging new translations like that of David Ives of The Heir Apparent, which manage to achieve the extremely difficult task of recapturing the sparkling and ingenious comic rhymes and rhythms that are at the very heart of Regnard’s effervescent and still highly entertaining evocation of early 18th century French society. Romantic and financial manipulations have been at the heart of comedy from the Greeks to today, and Regnard offers his own unique and witty exploration of these familiar themes in comedies that deserve the opportunity of delighting new audiences today and in the future.